Tips and tricks for fix SONY XPERIA Z5 (DUAL) problems with several simple steps. This phone have one single GSM simcard or dual GSM simcard, but all of them use nano simcard slot. What is interesting at SONY XPERIA Z5 (DUAL) (E6603 / E6653 / E6633 / E6683)? There are several important features like waterproof with IP68, Fingerprint sensor for running with applications and give more security protections and good bright and clean 5.2 inches LCD screen with Triluminos display technology. SONY XPERIA Z5 (DUAL) powered with Qualcomm 64 bit Octa Core processor. How to Fix or Problem Solving for Recovery SONY XPERIA Z5 (DUAL) (E6603 / E6653 / E6633 / E6683) hang or not responding or malfunctions or stuck or freezing or bricked ? SONY XPERIA Z5 (DUAL) have big internal memory as 32 GB ROM, but this capacity also use for operating system and factory default applications, so we will not have fully 32 GB internal memory capacity, with big internal memory we can install many applications from Google Play Store like Facebook, Instagram, Whatsapp, Blackberry Messenger (BBM), Line Messenger, WeChat, Skype, Viber and many more. But please remember, some applications especially not famous applications may contain viruses or malware, if we install that kind of apps then our SONY XPERIA Z5 (DUAL) will become hang or stuck or bricks or frozen or boot logo loop or LCD touch screen not responding in the middle of running applications. If we get this trouble, we have to force shutdown or force reboot or soft reset to restart all running applications, remove temporary files and caches. After our SONY XPERIA Z5 (DUAL) able boot properly, then we can try to install recommended antivirus from Google Play Store, then scan all files and applications, that antivirus applications can tell us which suspected applications or setting. If the problems still happen, then we have to do hard reset or master format. Please note, doing hard reset or master format will remove or wipe any important data, therefore we have to backup SONY XPERIA Z5 (DUAL) data before doing hard reset. How to Force Shutdown or Force Soft Reset or Reboot or Restart SONY XPERIA Z5 (DUAL) (E6603 / E6653 / E6633 / E6683) ? After installing many applications, maybe because of not compatible with SONY XPERIA Z5 (DUAL), then it can make hang or freezing or not responsive with any finger touch, then we have to force soft reset or force shutdown or reboot. How to do that? We have to know that a small reset button already available near the nano simcard slot, we have to open simcard cover first then beside simcard slot we can find small secret reset pin button, press and hold this small button with PEN or small paperclip until SONY XPERIA Z5 (DUAL) turn off automatically. After we sure this phone already totally OFF, then press again POWER button to turn it ON. This soft reset or reboot process will not remove anything, therefore we can do this process anytime we want. If we want to clean temporary files and caches while this phone still work normally, then press and hold POWER button until pop-up menu appear, then choose Shutdown / Power off / Reboot menu. The SONY XPERIA Z5 (DUAL) (E6603 / E6653 / E6633 / E6683) will continue the step until ready to use in clean factory default. Finish the PC Companion step and until it doing Factory Reset to SONY XPERIA Z5 (DUAL) (E6603 / E6653 / E6633 / E6683) to factory default Android operating system. How to Restore and Reinstall Clean Android Operating system / firmware at SONY XPERIA Z5 (DUAL) (E6603 / E6653 / E6633 / E6683) ? We can see videos and pictures with good view of Triluminos display technology. This colorful view also make playing 3D HD games will become more fun. However, sometime some installed applications can make our SONY XPERIA Z5 (DUAL) operating system become damaged or corrupted, this conditions can make something strange with this phone. We need to reformat or reinstall factory default Android operating system at SONY XPERIA Z5 (DUAL). How to do that? First we have to know that clean factory default Android operating system file source already saved safely inside SONY XPERIA Z5 (DUAL) ROM or internal memory, therefore we do not need to copy from other resource or connect to other device, just follow simple steps to hard reset above, then clean factory default Android operating system will be reinstall automatically at SONY XPERIA Z5 (DUAL) (E6603 / E6653 / E6633 / E6683). How to Unlock or Fix or Bypass or Solutions for SONY XPERIA M5 (DUAL) (E5603 / E5653 / E5606 / E5633 / E5643 / E5663) forgot password code or security lock screen pattern or pin (lost password)? What we get from SONY XPERIA Z5 (DUAL) (E6603 / E6653 / E6633 / E6683) is good main camera with 23 megapixel at back side of this phone. We can take many good photos at our daily activity, moreover this phone have dedicated camera button that make this phone can work like real digital camera, ready to capture without need to touch any soft button at LCD screen. Some photos or video recorder are maybe only for private use, therefore we have to give security protections to make sure all files secure while SONY XPERIA Z5 (DUAL) (E6603 / E6653 / E6633 / E6683) away from us or stolen or lost. What is important improvement at this phone is the Fingerprint sensor that build in together with power button in the side of the body. This fingerprint sensor is one of options to secure our phone, there are also other build in alternative like screen lock pattern or password pin protections. The problems might be happen when we forgot security protections at SONY XPERIA Z5 (DUAL) (E6603 / E6653 / E6633 / E6683) how to unlock it? Do not worry because we can use Google account to unlock forgot security screen lock pattern or password pin protections or fingerprint sensor at SONY XPERIA Z5 (DUAL) (E6603 / E6653 / E6633 / E6683), please try to give several time wrong answer when it ask for question, after several time then SONY XPERIA Z5 (DUAL) will locked or freezing 30 seconds, at this time we can type our Gmail username and password that we have already signed-in before. If we still can not access our Gmail account, then we have to do hard reset using PC Companion steps above. How to Improve Performance SONY XPERIA Z5 (DUAL) (E6603 / E6653 / E6633 / E6683) to make run more faster? Many review give good result for SONY XPERIA Z5 (DUAL) (E6603 / E6653 / E6633 / E6683) performance, because this phone use Qualcomm 64 bit Octacore processor and 3 GB RAM. But some users maybe get trouble with running slowly of their SONY XPERIA Z5 (DUAL). First we must aware that some applications that we have installed from Google Play Store may keep run in the background to wait data update. We have to know all applications which run in the background or foreground will need some amount of RAM, therefore if many of them run together, then 3 GB RAM at SONY XPERIA Z5 (DUAL) (E6603 / E6653 / E6633 / E6683) will insufficient and this phone will run more slowly, because it have to try find which old applications that can be force close to give more RAM for the systems. Therefore at this conditions, we suggest to uninstall some not use applications. If we want to make SONY XPERIA Z5 (DUAL) (E6603 / E6653 / E6633 / E6683) performance run faster again like new, then please consider to do hard reset or reformat this phone. Is That Any Secret Code for Doing Format SONY XPERIA Z5 (DUAL) (E6603 / E6653 / E6633 / E6683) ? There is no secret hidden code for SONY XPERIA Z5 (DUAL) (E6603 / E6653 / E6633 / E6683) to make it back to factory default. Do the options above to hard reset this Android. 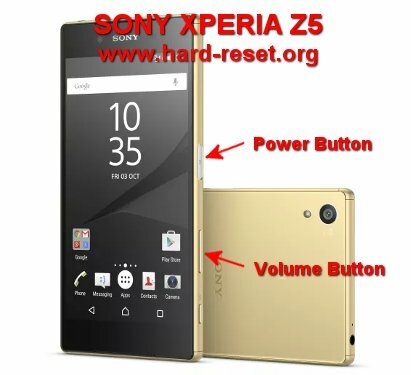 [Q] Dear HardReset , Good Day , I have an E6633 Sony Z5 , i have visited your site and tried some methods on resetting my Z5 I cant get reset by using phone buttons . Power Button + UP Button . No matter how many times i press those buttons , still cannot get into the configuration page or setting page at all I even visit Sony Local Stores , the store crews told me not all SONY mobile set are able to do so by pressing power + UP button but only certain models are allowed to do so Please advice what did i missed for the Hardware Key Button reset ? thank you Carebear. [A] Hi, please try to do hard reset / reflash your Sony Xperia Z5 using PC Companion like steps at #option 4 above. You need to prepare PC computer which use Microsoft Windows operating system like Win 7/ Win 8/ Win 10, then download PC Companion software from Sony Mobile website. Install that software at your computer then please use proper USB data cable to connect your Sony Xperia Z5 to USB computer when the PC Companion software tell to connect. Please follow the steps at #option 4 above carefully. By using PC Companion, your Sony Xperia Z5 phone will also get the latest official ROM or operating system from Sony. The information from this page describe about factory reset sony experia z5 (e6653),how to hard reset sony xperia z5 dual using flashtool,xperia z5 e6683 codes. If you need another resource for hard reset, use search function at this homepage or find from our related posts. How to Easily Master Format XIAOMI MI MIX 2 / MI MIX EVO with Safety Hard Reset? Please advice what did i missed for the Hardware Key Button reset ? Hi, please try to do hard reset / reflash your Sony Xperia Z5 using PC Companion like steps at #option 4 above. You need to prepare PC computer which use Microsoft Windows operating system like Win 7/ Win 8/ Win 10, then download PC Companion software from Sony Mobile website. Install that software at your computer then please use proper USB data cable to connect your Sony Xperia Z5 to USB computer when the PC Companion software tell to connect. Please follow the steps at #option 4 above carefully. By using PC Companion, your Sony Xperia Z5 phone will also get the latest official ROM or operating system from Sony.